Before we begin our usual weekly commentary, we wanted to take a moment to honor the victims of Sunday's terrible attack in Orlando. Though details are still scarce, it is the most devastating mass shooting in U.S. history. Our thoughts are with the victims, their families, and with the community that now must cope with the aftermath of the tragedy. As we look for answers, let's also remember to be grateful for the ones we love. Though stocks reached new 2016 highs last week, they ended the week mixed as investors showed nervousness ahead of Britain's vote on exiting the European Union. For the week, the S&P 500 slipped 0.15%, the Dow gained 0.33%, the NASDAQ fell 0.97%, and the MSCI EAFE lost 1.79%. Though fear took over last week, some strategists believe that the S&P 500 could still test new historic highs in the days ahead, indicating that there's still some optimism on Wall Street. What's going on in Britain? On June 23, Great Britain will hold a national referendum on whether or not to remain within the EU. The polls had shown that both sides were neck and neck, though the pro-"Brexit" (British exit) side has recently opened a 10-point lead. Though Britain retains the pound sterling and isn't part of the monetary union, it is a member of the 28-member European Union, which gives it access to the EU's tariff-free single market, accounting for 45% of Britain's export trade. One estimate suggests that Britain's trade with Europe is 55% higher than it would be had it not joined the EU. Why would Britain want to leave such a lucrative arrangement? What would a Brexit mean for U.S. investors? Markets would likely react badly if Britons voted to leave the EU. The situation would create serious uncertainty about the future of the EU, and markets hate uncertainty. We don't know exactly how a Brexit would play out; many legal agreements would have to be renegotiated, work situations for EU and British citizens would be left in limbo, and the political climate would drastically change. However, these consequences would play out over several years as both sides negotiate the exit. Estimates on the cost of a Brexit vary; one worst-case scenario projects a 6.2% loss of economic growth in Britain by 2030. Another estimate projects a best-case scenario of a 1.6% increase in Gross Domestic Product. It's very difficult to predict the relative benefits and costs because so much depends on exit negotiations. 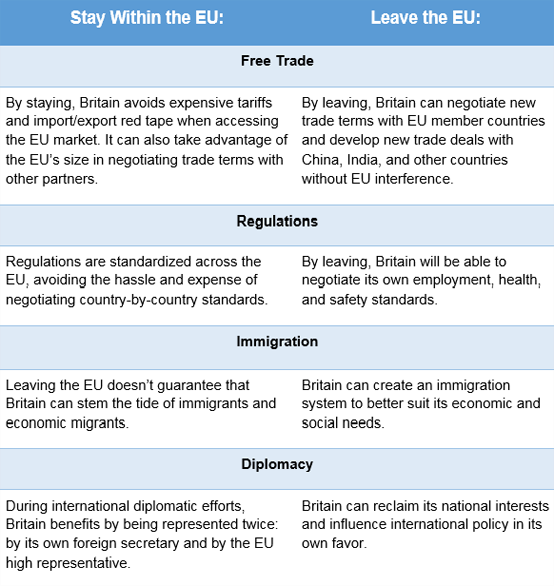 However, since Britain and Europe need each other, it's likely that post-Brexit negotiations would be favorable to free trade, making the worst-case scenario unlikely. Many of the worst-case fears regarding a Brexit are similar to those we faced in 2015 with the "Grexit" or Greek exit. The departure of an important member nation could fracture the EU and cause other countries to consider following suit. Though it seems unlikely that a Brexit would seriously harm U.S. interests, Federal Reserve Chair Janet Yellen stated that the Fed would consider the potential impact of a Brexit when setting interest rate policy this month. Most experts don't expect the Fed to raise rates this week, though there's always room for a surprise. Consumer sentiment slips in June. A measure of how Americans are feeling about the economy and their prospects fell slightly even though Americans are feeling the benefit of higher wages. Jobless claims fall unexpectedly. The number of Americans filing new claims for unemployment benefits fell last week, suggesting strength in the labor market after May's weak hiring. Employers announce most job openings in nine months. Though employers are posting record job openings, they are holding back on filing them, suggesting businesses may have concerns about economic growth. Personal spending surges in April. Though the world is still gripped in an oil-supply slump, supply disruptions in several oil-producing nations gave oil prices a recent boost.